The Beanstalk Music & Mountains Festival features swimming, tubing, rafting, hot springs and miles of hike and biking trails around Rancho del Rio. The musical lineup includes members from Vulpeck and Disco Biscuits as well as bluegrass up-and-comers Horseshoes & Hand Grenades. What: Beanstalk Music & Mountains Festival. RANCHO DEL RIO — Beanstalk Music & Mountains Festival has confirmed its return to Rancho del Rio for this year’s festival, June 28-30. 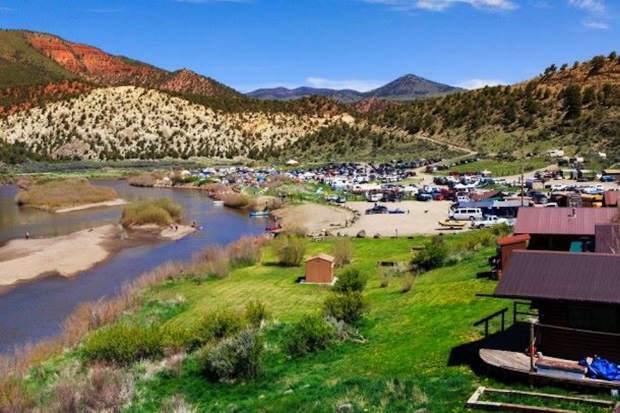 Rancho sits along the banks of the Colorado River nestled into the Rocky Mountains less than an hour’s drive from Vail. It features activities including swimming, tubing, whitewater rafting, hot springs and miles of hiking and biking trails. The boutique camping and music festival, hosted by Magic Beans, focuses on combining art and the environment of Colorado. Tickets start at $40 and go up to $200. This year’s lineup features members of Vulfpeck, Disco Biscuits, Lotus, JRAD, Dopapod, Tauk and more. There will also be some of the newest acts on the scene in Magic Beans, Aqueous, Horseshoes & Hand Grenades, Ghost Light and a slew of other local music Colorado has to offer. Bring your tube, sunscreen and friends for a weekend at the river, or just a day. For more information, visit http://www.beanstalkfestival.com.